The parents of a woman who took her own life at a mental health hospital say failings in her care were "unbelievable". Claire Greaves, 25, from Pontypool, was a patient at Cygnet Hospital, Coventry. An inquest jury found care failings contributed to her death in February 2018 and reached an open conclusion. Cygnet said it had learned lessons from the investigation, while Aneurin Bevan health board is reviewing placements for people with complex needs. Claire was a mental health campaigner and writer who had suffered with anorexia and a personality disorder from an early age. In May 2017, she was moved from Abergavenny's Nevill Hall Hospital to Cygnet. "I wish I could just go home, I don't want to be over 100 miles away from home for such a long time," she tweeted at the time. 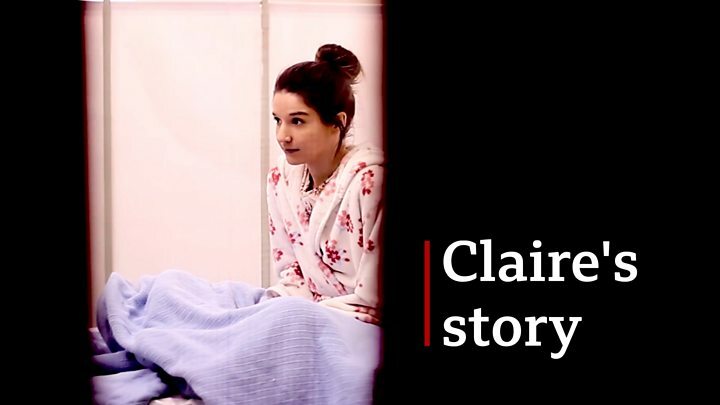 Her parents Colin and Debbie Greaves said they were told it was the only available hospital that could manage both of Claire's conditions and were "reasonably positive". But they soon had concerns about staffing levels and a lack of access to therapies. Claire was placed in "seclusion and long-term segregation" and her parents were told they could not contact her for several weeks. "She told us that she had no furniture in the room, that her mattress was brought in at night for her to sleep on and then taken back out," Mr Greaves said after a phone call in January 2018. "She also mentioned that there had been poor support for her hygiene whilst she was in there." They were trying to get her moved to a hospital nearer home when she died. An inquest jury reached an "open" conclusion, and did not decide it was suicide. Claire had been assessed as being at high risk of self-harm or suicide between 17:00 and 18:00 each day. But she was able to obtain a piece of fabric left on the floor outside her room and used it to kill herself alone in her room. Had there been "sufficient staff" then Claire's care plan could have been followed and the risk period of 17:00 to 18:00 "would have been covered"
Mr Greaves said he felt "numb" when he heard the conclusions, adding: "It seems unbelievable that can happen, they can miss ward rounds, that they can make changes without doing the proper risk assessments, that they cannot follow care plans. He said he believed the move would help his daughter but the fact it did not meant he now felt guilt as well as loss. Image caption Debbie and Colin Greaves called the hospital's failings "shocking"
The Care Quality Commission (CQC) had already raised concerns about Cygnet before Claire's death. This lack of consistency led to some patients feeling unsafe on the wards, the CQC said. Another CQC inspection published five months after Claire's death found staffing was still a problem, with 61% of employees not comfortable with their daily workload. In its own investigation into Claire's death, Cygnet concluded the "root cause" was Claire's ability to "access material from another service user at a point when this was not seen by staff and was then able to ligate with it". The report also stated days before Claire's death there was a reduction in her "observation levels", with the reason "unclear". Her parents said they have not received an apology, or any communication from Cygnet, since the inquest. The company said: "We were deeply saddened by Claire's death in February 2018 and we continue to extend our sincere sympathies to her family. "We have already implemented a number of measures to address the key learnings from this and we will ensure that we comply fully with all of the recommendations made." A spokesman for Aneurin Bevan University Health Board also offered condolences to the family. "We have undertaken a full review of the board's role in commissioning Ms Greaves' placement at Cygnet Hospital and are currently implementing a number of recommendations to review placements for individuals with complex needs," he added. You can watch the full story on Wales Live on Wednesday at 22.30 BST on BBC One Wales and after on BBC iPlayer.